This Boone NC Log Cabin Rental was the owner’s home of an old camp site and is located at the end of Mine Branch Road, exactly 1 mile past Tweetsie Railroad, on the way from Blowing Rock to Boone NC. The log cabin rental is 3 miles from the North Carolina Blue Ridge Parkway and Appalachian Ski Mountain in Blowing Rock NC. 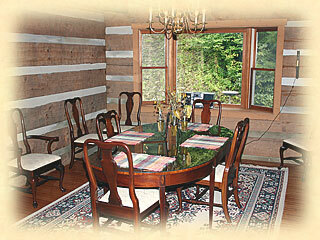 This log cabin rental is close to the restaurants and shoppes in Blowing Rock and Boone NC. Cabin Fever is recognized by the Tweetsie as an official lodging partner. Being only 5 minutes away, Cabin Fever is a perfect choice for families going to Tweetsie. We can provide Tweetsie tickets at a reduced price. Bedrooms: 4 - Baths: 2 - Sleeps 8 - 2 Queens, 2 Doubles, 2 Twins. Amenities: Washer/Dryer, Dishwasher, Microwave, 2 TV’s with cable, DVD, VCR, Wireless Internet WIFI, Pool Table, Large Wood Burning Fireplace, Gas Heat, Air Conditioning, Hardwood Floors, Skylight, Large Covered Front Porch with Rocking Chairs. This charming 4BR/2BA log cabin rental is full of character! Nestled in the trees between Blowing Rock NC and Boone NC, this cozy log cabin rental is a wonderful family home, perfect for any age group. The log cabin has been completely refurbished and has hardwood floors throughout. A huge skylight floods the living areas with welcome sunlight. A deck on the back is equipped with a grill and comfortable seating. 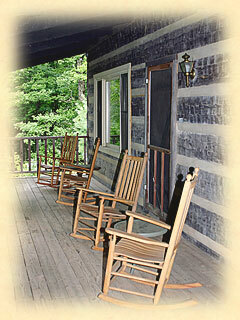 The large front porch is filled with rockers and a picnic table. The setting is ideal for an exploration. Deer, raccoons, and other wildlife are often sighted around the cabin. Peaceful and serene, the stars shine bright and you feel as if you are the only people on earth. No other cabin is visible in the area. Even though the old campground is long gone, the walking trails still meander around the area. As quiet as the area is, it is still only a five minute drive to town! However, you can hear the whistle of Tweetsie Railroad echo throughout the valley. Log Cabin Square Footage: Approx. 2,400 sq. feet. Complimentary WIFI provided for our guests with laptop computers. 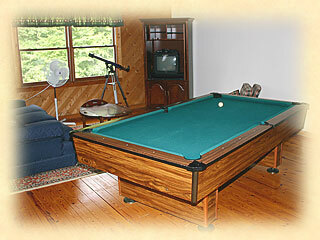 Upstairs in the log cabin is a spacious loft with sitting area, Wireless Internet, Cable TV, VCR and pool table. Two more spacious bedrooms are found on the second floor along with the full bath which includes a large soaking tub. The downstairs den has hardwood floors, and a huge 20 ft. high rock fireplace in the center. A large dining room and spacious kitchen with a pass through bar are adjacent to the den. Down the hall are two bedrooms and a large bath. On the main floor is the laundry room. In all there are over 2,400 sq. ft. of living area in the log cabin. Modern conveniences such as dishwasher, microwave, air conditioning and gas heat are blended with the beautiful log walls and ceilings of this unique log cabin rental. Holidays and High Season Weekends will be more. No Smoking. Pets - Please Call. Click to download and print a copy of our Rental Contract. ©2019 Cabin Fever Log Cabin Rentals of Boone, North Carolina. 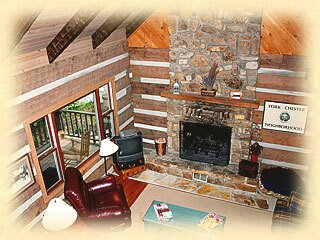 Blowing Rock and Boone NC Log Cabin Rentals in the Blue Ridge Mountains of Western North Carolina.